Wainscoting removal isn’t necessarily difficult. Meaning, it does not require special skills or tools. But, it’s not all that easy because it does require a bit of patience. The reason is when you remove wainscoting, you need to avoid damaging the wall behind it. Otherwise, you create more work and incur an added expense. The biggest challenge won’t be removing the Wainscoting. Nope. That’s actually the easy part of the process. What will pose the biggest problem is what to do with the debris material. When you remove things like Wainscoting and/or trim, or any other type of paneling, you create a whole lot of debris. So, you’ll have to do something with it. Break the seal. 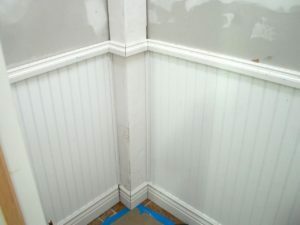 Wainscoting is usually installed sealed against the walls. This is typically done with caulk so moisture cannot get between the paneling and the walls to form mold. Use a utility knife to cut into the seal gently across the top of the wainscoting, going around the entire room. Find the studs. Next, you’ll locate the wall studs with a stud finder, if the nail heads aren’t visible. Use a pencil to mark the locations of the studs. Then, you can find all the nails that run vertically into the studs to pull them out. Take the panels off the wall. With the top railing off and the baseboards off the wall, you can then simply pull the panels away from the wall to finish. If you need any sort of remodeling debris removal, just phone 800-433-1094 or visit Junk Garbage Removal.